The Park Tool I-Beam mini folding tool series has generally kept to fewer tools, keeping he models simple and lightweight, but perhaps not always enough, if you know what we mean. The IB-3C Mini Folding Multi-Tool breaks that mold, but is still compact and pretty lightweight for such a useful mini design. The I-beam design is just like you'd expect- the tools are bolted to a central piece of anodized aluminum stock. The tools sit on either side and what isn't being used is essentially the "handle". 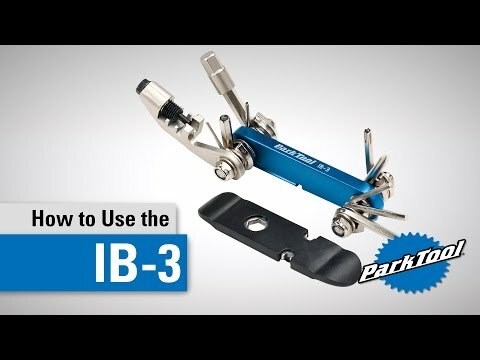 The IB-3C packs 15 tools, with 3 integrated into a steel core tire lever that clips onto the I-Beam when stored. The C in the IB-3C stands for chain tool and the version here is 5 to 12-speed compatible, but does not have the required peening anvil for the Campagnolo 11-speed chain. With 1.5, 2, 2.5, 3, 4, 5, 6, and 8mm hex wrenches, a Torx T25, flat blade screwdriver and the chain tool mounted on the I-Beam; the composite covered steel tire lever features two spoke wrenches- 3.23mm (SW-0) and 3.45mm (SW-2), an 8mm box wrench, and of course it is a tire lever. The 8mm box wrench is the tool used to drive the pin of the chain tool. In other words this is a truly useful and well conceived mini multi-tool for road or mountain use that is 3.5" x 1.6" x 1" when closed. At 170 grams, the weight is very reasonable is such a functional, comprehensive tool. The hardened steel tools have precision interfaces with the Hex keys featuring chamfered edges for ease of use and protection of the receiving bolts. The tools are fastened to the I-Beam via stainless steel bolts with nyloc-type locking nuts to ensure the system doesn't loosen up and fall apart when you need it most. Please be aware that the 8mm Hex key is actually a fitment that slide onto the 6mm Hex key. As you can tell, we are fans of the IB-3C I-Beam Mini Folding Multi-Tool, and we aren't the only ones, as this is an award winning design well received across the bicycle world.